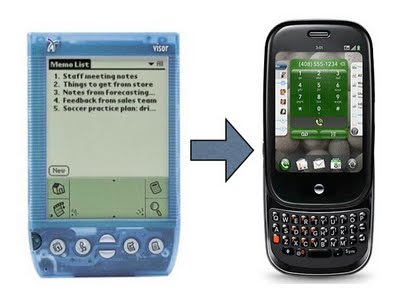 Through a very long string of back channel communications, I have received a question about moving data from a Handspring Visor Deluxe to a webOS device; I think it was a Pre. There is no direct way to move data between a Palm OS device and a device that is running webOS. Both operating systems were developed by Palm before being acquired by HP, but the underlying technologies are vastly different. But there is still hope for people looking to move data from an old Palm OS device to a new webOS smartphone or tablet. Keep reading for suggestions on how to move your data. The easiest option is to work with a Palm OS device that is capable of HotSync'ing with Palm Desktop on a Windows XP machine. You will need to start by downloading Palm Desktop if you don't already have it installed. Once you have your data synchronize with your PC, use the File > Export commands to backup your data. You will need to do this for the Address Book/Contacts, Date Book/Calendar, To-Do List/Tasks, and Notes/Memos one at a time. Backing up your data helps make sure you that you can get back to where you started if something goes wrong.